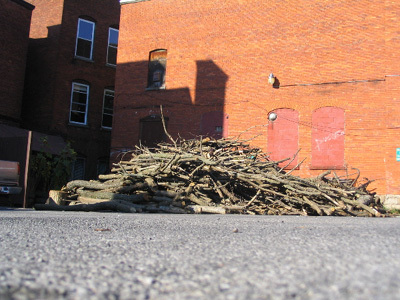 This site-specific installation consisted of building of a ‘man-made’ beaver dam. 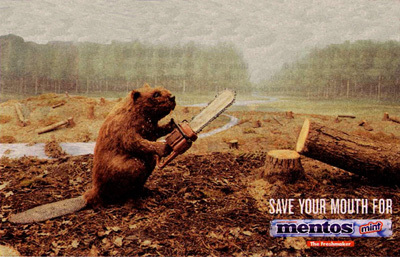 Within the parameters determined by my Manhattan Project, the similarity between the beavers and the Dutch is that both build dams, though one creates a ‘wetland’ environment, the latter reclaims land from the sea. In the Damn It performance the notion of usefulness* and diligent (working) behaviour is brought into question. Being ‘busy as a beaver’ addresses the issues of the Calvinistic work ethic along with an industrious technical expertise, qualities the Dutch incorporated in building the new colony (US) which can be attributed to the Dutch influence upon America.